Pippa (1st Brit!) and Ed at the end of the weekend’s other race! 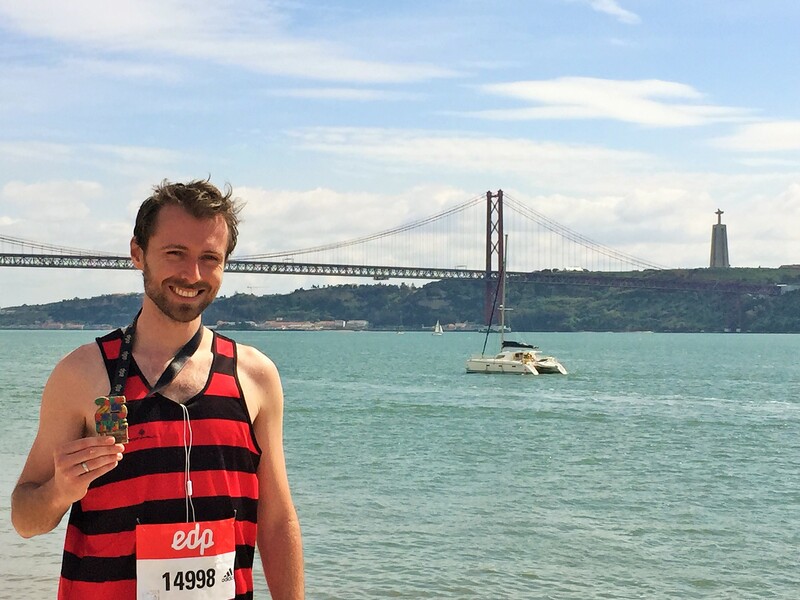 The Lisbon Half-Marathon was a strange race where both the organisers and I seemed to have got many things right but forgotten the basics: in my case, not setting off too fast; in the organisers’ case, well, just organising the whole thing properly. On the plus side, they did some things really well such as a really flat course, good marshalling throughout, well-stocked refuelling stations, a free 7km race for international runners (Pippa & Ed!) the day before and nice medals. On the downside, the Portuguese seem to enjoy the idea of queues, but not necessarily enjoy queuing… Although there were only a handful of people in front of me to pick up the race numbers on Thursday morning, it still took over 45 painful, sauna-like, minutes to go through a process which somehow involved lining up in three different queues and being given three different race numbers. 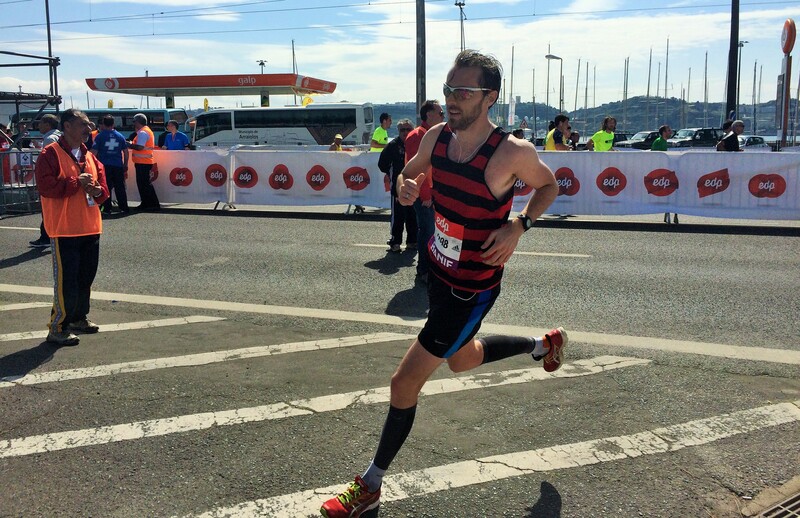 The morning of the race wasn’t much better: although elite runners (sub 1h05!) started separately, non-elite runners all started across the estuary on the motorway. For some unknown reason, the organisers decided there should be no starting pens: it was a first-come, first-served basis for all 20,000 runners as both the half marathon and a 7km race started at the same time. 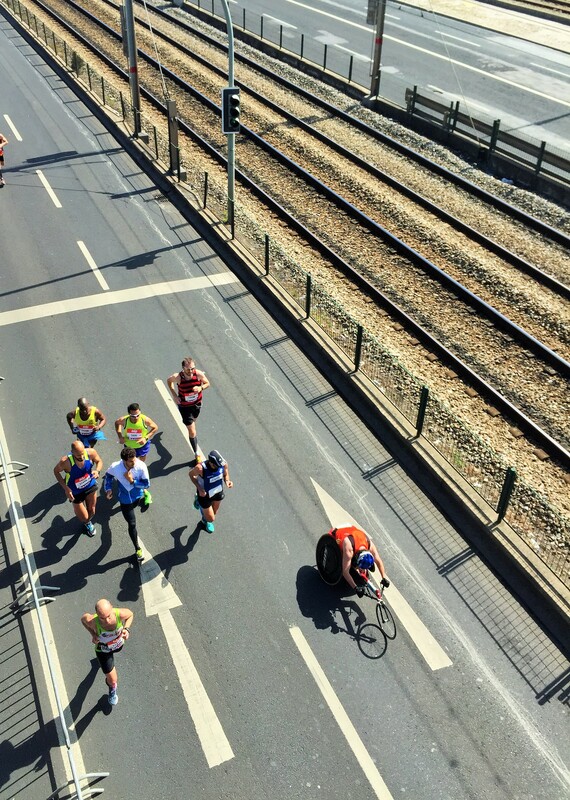 With only one bridge and one train leaving every 20 minutes heading to the start line in the morning, you already felt like you’d run a half marathon just surviving the train which was on a par with the Northern Line on a bad Monday morning. Finally, we set off under beaming sunshine and the watchful look of Lisbon’s 80m high replica of Rio de Janeiro’s Christ the King statue. By that point, I wouldn’t have been surprised to look up and see tears pour down his face because of the event’s organisation. My legs were stiff as wood from standing still for so long and my stomach was rumbling a little from hunger and not from the usual nerves but that was me off. 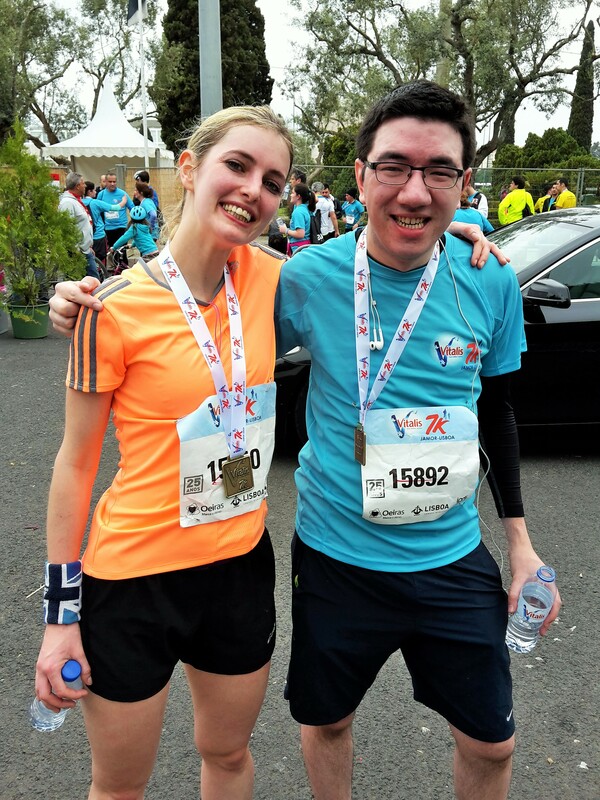 As the 30m lead which the “100 Euro runners” had been given slowly disappeared, I was lucky to have a relative opening in front of me so I could keep running too fast. On the other side of the road, there were far more VIPs and, as the slower ones got caught up, there was quite a lot of shouting in Portuguese of what I assume was “get out of the bloody way”. The middle of the motorway was a metal grid which no one other than me wanted to run over so I used this as the perfect opportunity to practice my poor pacing up the hill which was … the last one in the race! Yes, this course really was piss easy… From then on, it was a gradual downwards from the bridge and a steep slope down from the bridge to sea-level. After this, it was a flat-as-a-pancake race: go east along the Tagus for a few kilometres, take a U-turn and go west for 10, take another U-turn and go east for a few and finish! Some of the basics kept being missed as you went along: other than slightly odd time-split measurement mats (4km, 8km, 14km and 18km?? ), the road wasn’t properly separate between runners going one way or the other. By the time I’d reached 10km, our side of the road was already reduced to 1 out of 4 lanes. It didn’t matter as there were so few of us on our side at that point but I can only begin to imagine the mayhem it must have been by the time the main body of runners got there. 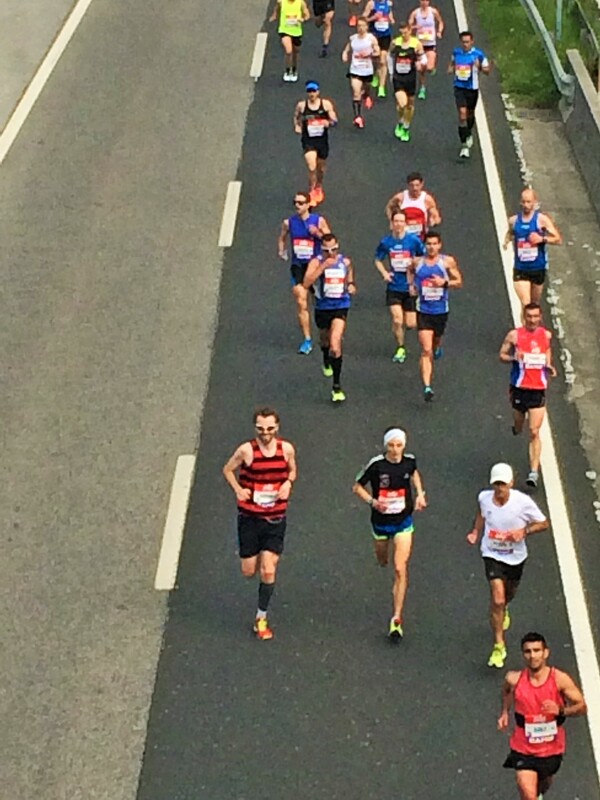 A few kilometres and energy gels later, I looked across to road as I went past the Belem Tower to see Mo Farah whizz by to his European Record. I didn’t know he’d be running so took a second look to double check it was him. I assume he did the same when he saw me. 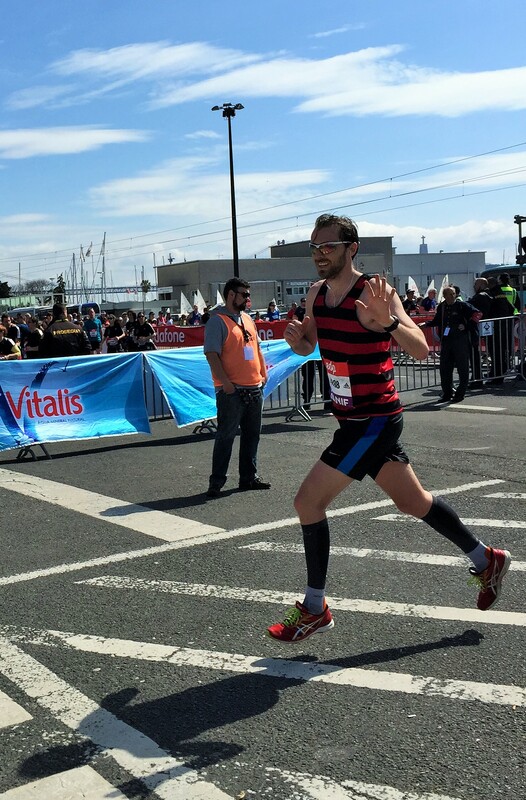 Seeing him zoom by at my normal sprinting speed looking so comfortable gave me [a kick in the stomach and] some final motivation to speed up a little.